The first pages of TNT-Audio went online in 1995 however those were written in Italian only. For this reason we celebrate our first (!!!) 20 years of web presence in 2016, though our magazine is actually slightly older than that! Those were the days of the very first web pages and websites. 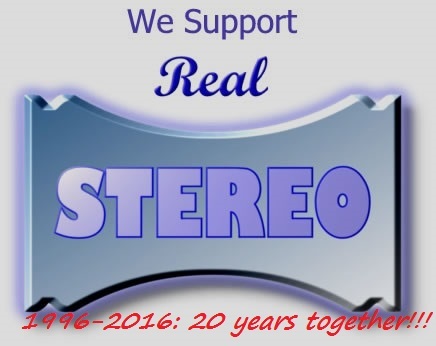 Most of the leading HiFi Companies hadn't a website yet, go figure! We, together with a few others (Enjoy the Music and Soundstage) were the pioneers. We started with a precise goal in mind: publish honest reviews in a completely independent way: no advertising banners, no subscriptions, no kind of external support. Just a bunch of brave audiophiles with a (crazy) mission in mind. Moreover, the magazine had to be completely international, in the sense that reviewers had to come from different Countries in the World. We felt this was the way to go, in order to reach a wider scope and audience. Many reviewers came and left, during these 20 years, some were extremely precious and devoted to our mission, some others were less faithful and serious but everyone gave his own contribute to make this magazine a lively place where to find new ideas, designs, different points of view etc. Some of them became even highly appreciated HiFi designers or journalists for different mags. Nowadays our “wild bunch” includes the usual dirty dozen of reviewers from Europe, USA and New Zealand and we're always searching for new ears and keyboards. We truly believe variety is the spice of life so - if you aspire to be “different” - feel free to contact us (mail to: editor@tnt-audio.com) and tell us why. And since the best things in life are free, we expect our aspiring reviewers to be motivated by our same spirit: share information and experiences with the audiophile community, with no commercial interest of any sort. During all these years spent auditioning & testing HiFi gear and writing articles we've had lots of fun and, from time to time, got bored with components or people from the HiFi biz. Not every HiFi component is fun to review. Sometimes they can be so damn boring that writing an interesting article is a very tough task. Sometimes interacting with the guys from certain HiFi Companies or distributors is a pain in the neck, because they try to force us to write only extremly positive reviews. Of course, being completely free from business relations with them helps a lot, in such situations. So...what's next? What are our plans for the next 20 years? First of all, we hope our ears will survive and serve as reliable reviewing tools for the years to come. We're getting old, we will miss a couple of Hz of frequency response as each year passes. Secondly, we will continue reviewing and discovering interesting gear, possibly components with a very high quality/price ratio, as this was one of our goals when founding this magazine. We'll also try to continue offering free DIY designs, projects and tweaks, like those that made our magazine so renowned among the DIY crowd. And we'll keep an eye focused on the new frontiers of technology, while not forgetting the good things from the past. Our vintage section will continue to grow. A huge, heartfelt THANKS go to our staff of translators and proofreaders, without their silent and precious work TNT wouldn't exist!